Water pennywort Hydrocotyle vulgaris, from Robert Paul Hudson. 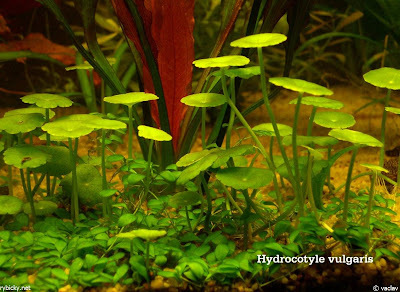 Hydrocotyle, the water pennyworts, is a genus of aquatic and semi-aquatic creeping plants. Some species are cultivated in aquaria but they are also known in some areas as invasive weeds. Characters (from She, Watson & Cannon): Herbs, perennial. Stem slender, creeping or decumbent, rooting at the nodes. Leaves petiolate; petioles not sheathing; stipules present, entire or parted to base, membranous; blade cordate, orbicular, or reniform. Inflorescence a simple umbel; umbels sometimes densely capitate; peduncles axillary, obsolete to much longer than leaves; bracts present or absent; pedicels very short or extended (best seen in fruiting material). Flowers bisexual. Calyx teeth minute or obsolete. Petals white, greenish or yellow, valvate, ovate, spreading. Stylopodium conic to depressed. Fruit globose or ellipsoid, strongly flattened laterally, base cordate, dorsal surface rounded, glabrous (rarely with white hairs); dorsal and lateral ribs usually conspicuous, slender, acute (rarely obsolete); vittae inconspicuous. Seed face plane to concave; endocarp woody. Carpophore usually absent. [WJ82] Webb, C. J., & P. N. Johnson. 1982. Hydrocotyle (Umbelliferae) in New Zealand: the 3-foliolate species. 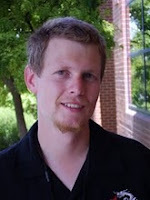 New Zealand Journal of Botany 120: 163–168.